Situated within the beautiful Chocó Forest within its own private reserve; you wouldn’t believe such a remote and private lodge could be only 100km from the capital, Quito. Located amongst lush reserve ranges ranging from 500 to 1200m above sea level, Mashpi offers a secluded getaway for travellers looking to escape and get up close with nature. Mashpi Lodge’s dedication to the preservation of the environment started with its sustainable construction. Designed to flatter its breathtaking natural environment, with floor to ceiling glass walls, its like you’re in the forest all the time. The lodge features modern contemporary décor that blends warm earth tones as well as steel, stone and glass to perfectly compliment the lush surrounds. Mashpi Lodge makes for a true luxury escape at the heart of the Mashpi Reserve. Mashpi has been carefully crafted to immerse guests in the surrounding forest filled with beautiful flora and enchanting fauna. The lodge itself serves as a luxurious retreat in the middle of the forest. The rooms are spread out across three floors, each and every one featuring striking floor-to-ceiling windows. Wake up every morning to the most spectacular views of the lush forest and immerse yourself in its natural beauty. Rooms and suites are complete with subdued lighting and automatic blinds that can be lowered or raised to adjust natural lighting levels. Mashpi offers three Yaku Suites and twenty Wayra Rooms. The three Yaku (Yaku meaning Water in Kichwa) are situated on the northwestern side of the lodge on the first floor. Each of the 495 square feet suites features a large bathroom with views into the enchanting forest. In addition, all suites offer generous king beds as well as luxury amenities and of course the best views in the lodge. Each of the Wayra (meaning wind in Kichwa) rooms, cover a spacious 366 square feet. Thirteen of the twenty Wayra rooms are twin rooms with two single beds. The other seven feature king size beds. For those travelling in groups, three pairs of Wayra rooms can interconnect to offer maximum comfort during your stay. The two storey high restaurant at Mashpi offers the finest gourmet experience. Inspired by Ecuador’s diverse cuisine, the menu features native ingredients and rich flavours of the forest. The chefs’ have combined modern techniques with ongoing culinary research, whilst still highlighting Ecuador’s rich culinary heritage. Mashpi Lodge, as well as offering 5 star luxury comforts; provides you with incredible activities to make your stay truly memorable. Spend your days engaging in nature trails, varying in difficulty across various terrains ranging from the earth and gravel of the main road to forest paths carpeted by leaves, and rocks through rivers. Mashpi Lodge offers a vast range of unique activities to truly immerse yourself into this natures paradise. The Sky Bike provides an original and stimulating way to explore the forest canopy up close; delivering guests the opportunity to fly over the forest and maybe even spot some wildlife. In addition, the “Dragon Fly”, delivers an exciting journey in an, open-air cable car system carrying up to 4 guests taking you through the gorgeous forest canopy. Furthermore, the private reserve features a range of waterfalls and gardens, an observation tower and a life centre; where guests can observe the natural surrounds as well as learn about the various flora and fauna of this spectacular forest. 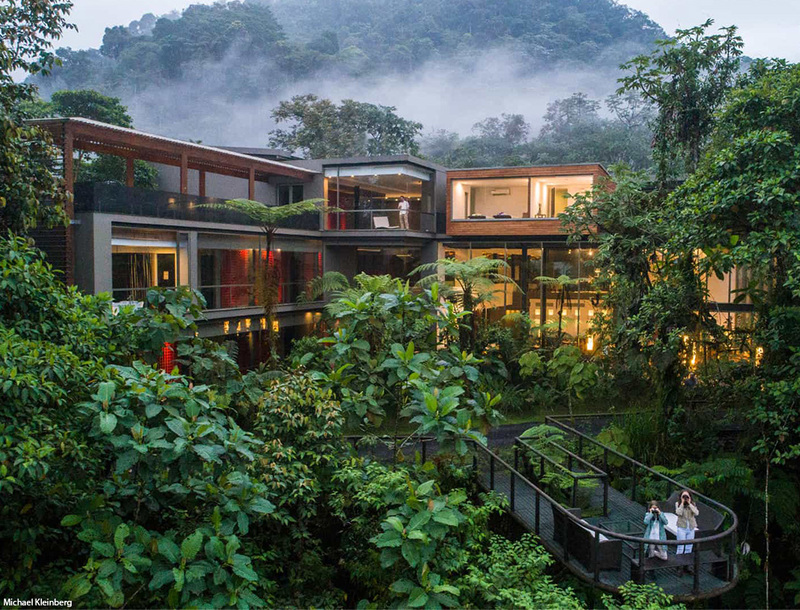 Mashpi Lodge is the place to be in Ecuador, where you can encounter 500 species of birds; trees and frogs found nowhere in the world; crashing waterfalls and mysterious wildlife. Relax in the luxurious comforts of the rooms and suites and indulge in the beautiful gastronomy of the gourmet restaurant.